I've been enjoying my summer wardrobe lately! Not that I think I'm dressing super fabulously, but my wardrobe is feeling more "me". I actually like most of the pieces, and I want to wear them, and if anything, I feel like summer is becoming too short - I won't have time to wear all the combinations I could. This is coupled with a new style realization - or a set of them. I'm not sure how to put it into words - but I like to read the blog Into Mind, and she did an interview with Kali of The Nife en l'air. Kali's descriptions of her style really resonated with me, and have, at least this week, given me a bit of a definition to my current style. She described hers as "androgynous and gamine". Through reading her thoughts, I realized that I feel most "me" when I'm in clothes with fairly simple lines, and at least one bright color. Kali linked to another blog, Lost in a spotless mind, who has a series on finding your style. It doesn't say anything that you all haven't already told me, but it's making some sense to me now, and I think I'm seeing trends in what style expresses who I am well. If you're still reading, I hope I didn't bore you to death. #1 print top with white jeans. It finally occurred to me what's wrong with this top: The straps are too long. I like the print though, so in to the mending box it goes. 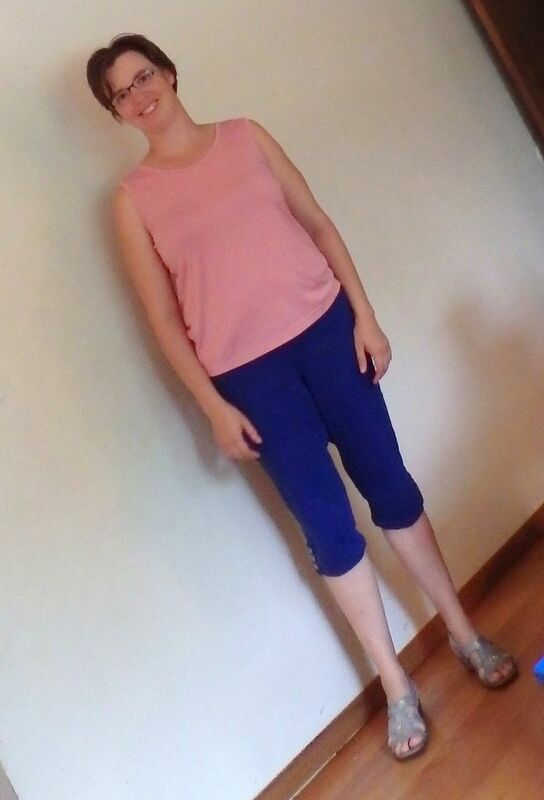 #2 pink top with cobalt capris. Hmm.. I think this pink is too close to my skin tone, and will find a new home. 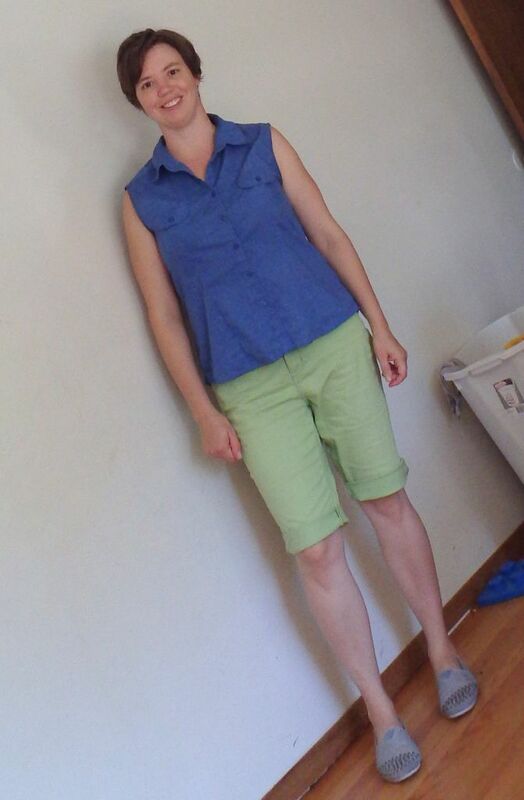 #4 A happy outfit - spring green shorts and a chambray sleevless top. This may be one of my favorite summer combos so far. (Though I had no idea what shoes to wear with it). I felt super comfy and very much like me). Oddly enough, as much as I like bright colors, to me blue isn't bright. It's almost a neutral. I don't understand why. Suggestions for improvement on my outfits? Thoughts on my naval gazing? The first outfit is my favorite, especially once the straps are shortened. I have to do that with all tanks unless they are truly petite. For the second outfit, add a casual pendant necklace or cotton bandana rolled to give some contrast to the pink color. How does the top in 3 look tucked or semi tucked? The colors are great. I can understand blue as a neutral...like denim. It seems to go with everything else. I love the pants in #1 & #2 but there is something not right about the fit of the tops - could be the straps in #1. The side folds in the photo of the pink one make me think it is too big for you. Love #3 & can totally see why you would be happy with it. The style & colour of this top looks much better on you than the first 2 imo, It is more androgynous/gamine too. I like 1 with straps shortened, and 2, the cobalt clams are great but I agree, that pink top is not the best for you. 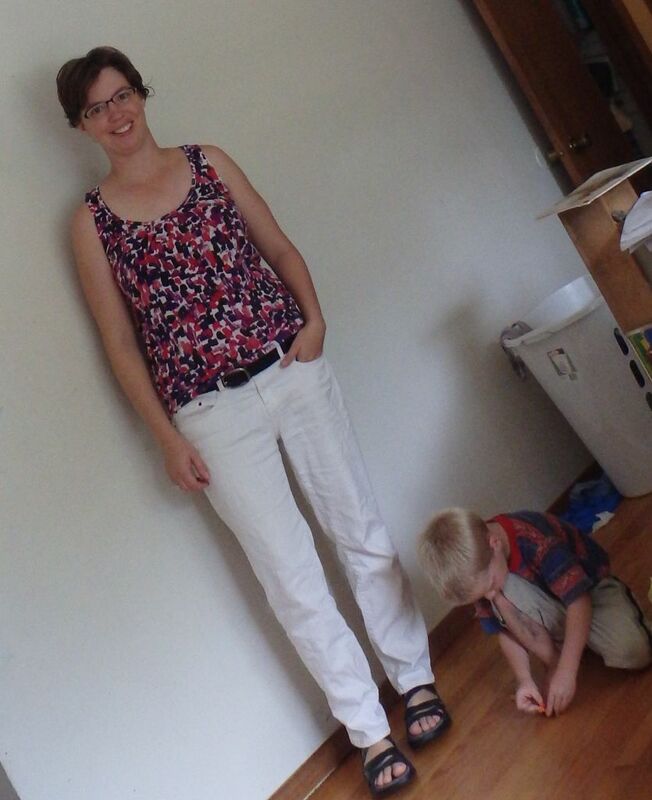 I always enjoy reading style musings so thanks for sharing yours. #1- love the print with the white and I think a strap tweak is a great idea. #2- I agree that the pink top does not look nearly as good on you as some of your others. Looking good amiable. I really like outfit 1 and 3 is great, too. Love the blue and green together. I like #1. Cobalt always makes me smile. I enjoy your reflections and introspection! I find myself still waffling around with style preferences, and maybe just need to accept 2 or 3 style variations is my thing. But I'm going to take a look at your blog references to see what I can glean from them. All three outfits are great -- good use of color and grounding with white or blue, and the sandals in 2 could also work with 3. I see great use of contrasts and fun colors in these outfits. Thanks for sharing your insights too. Sometimes it just helps to write it all down to sort out thoughts. You had me with the white bottoms so I like one best! Great look on you.